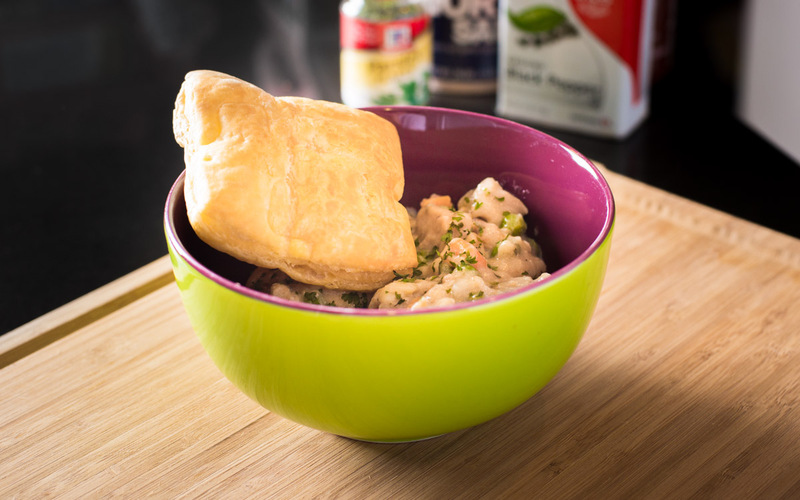 Chicken pot pie is one of those comfort foods you crave when the weather gets cold out. I saw this recipe on i am food blog and I thought Mr. A will love this twist on the classic pot pie. I was right, he liked it so much he went back for seconds! (Although he didn’t have lunch that day…) If that’s not a testament to the tastiness of this recipe 11 month old Jensen also had seconds and 2 1/2 year old Ian actually took a bite (victory in my book). This meal was easy and fast to throw together which is always important when you have 2 young kids. I made a couple of changes to fit the likes of my family. You can always use more Sriracha to your liking, but my young kids are a little sensitive to the heat. Prepare puff pastry, make sure it's thawed, the kind I purchased requires 40 min of thaw time. 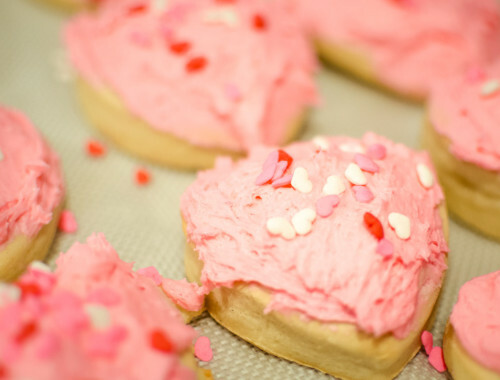 Unfold puff pastry carefully and using a large circle cookie cutter cut out circles and lay on a cookie sheet that has a silpat on it (or parchment paper). Brush tops with 1TB melted butter. Set aside until oven is done pre-heating, when oven is ready bake for 20-25 min, or until the puff pastry is golden brown and puffy. While pastry is baking, prepare chicken filling. Melt the remaining 2 TB butter in a large, skillet over medium-high heat. Add the onion and cook until translucent, about 5-7 minutes. Add the flour and stir to incorporate. IN a small bowl or measuring cup (capable of holding at least 2 cups of liquid) whisk together the milk and chicken stock. Pour the chicken-milk mixture in a thin stream into the skillet, whisking constantly. Bring to a simmer to thicken. Add the frozen peas and carrots, chicken, Sriracha and parsley and simmer, stirring often, until the chicken is cooked through, about 10-15 minutes. Season with salt and pepper to taste. Spoon chicken filling into bowls and top with a puff pastry circle or two. Enjoy immediately. Adapted from i am a food blog. Prep time includes defrosting of puff pastry.